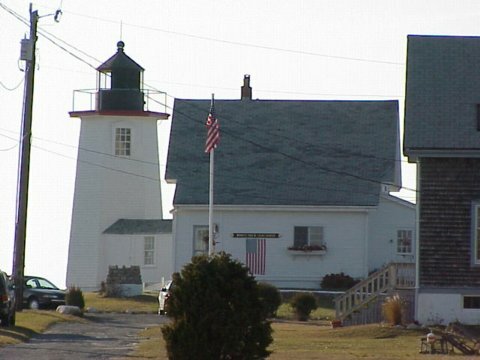 Wings Neck Light was built in 1849 because of heavy marine traffic travelling in Buzzards Bay to ports in Wareham and Sandwich. When the Cape Cod Canal opened in 1914, Wings Neck Light assumed its real importance for a number of years. The first lighthouse at Wings Neck was a Cape Cod-style lightkeeper's house with a lantern placed on the roof. In 1889, damage from an earlier fire and general disrepair forced the construction of a new lighthouse. The present keeper's house, with its attached hexagonal wooden tower, was built to replace the old Cape Cod-style house. For many years, Wings Neck was deemed one of the most important lighthouses on the Atlantic Coast because of the heavy shipping travelling the Cape Cod Canal. By 1943, the lighthouse was becoming obsolete and a 'skeleton' tower was constructed to replace the original. The property was sold by the government in 1947 and Wings Neck Light and its surrounding area are now privately owned with no public access. The lighthouse and surrounding land are private property and not open to the public. From the rotary on the Cape Cod side of the Bourne Bridge take Route 28 south. Stay on Route 28 for 3.4 miles then take a right onto Barlows Landing Rd. Follow Barlows Landing Road for 2.1 miles then take a right on Wings Neck Road. Stay on Wings Neck Rd. 2.1 miles. You'll then come to a cul-de-sac. The lighthouse is on private property with no trespassing signs. Pull out your long lens and take pictures from a distance.